After several years in the ground and being grown in East Africa, a pink mutation has been found of the well-known white Kordes’ variety ‘Athena’. 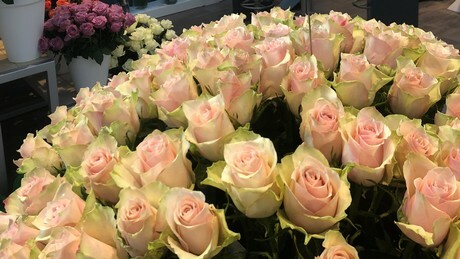 As ‘Athena’ is already the brand for a white rose coming mainly from Kenya and Ethiopia it was easy to give the newborn baby a name: ‘Pink Athena’. ‘Pink Athena’ is a real mutation with all the characteristics of the original variety ‘Athena’. "As Athena is well known for its super vase life at the consumers and very good production at the growers, it will make its way to become the new standard in pink colors", Kordes expects. The new Athena’s difference is only the color: a soft pink appearance surrounded by a light greenish to apricot touched outside petal. "With its shape it fits perfect to all kinds of floristical arrangements." This mutation was found at Timaflor at Mount Kenya and introduced at the Dutch auction. Now it will be released to other growers for direct markets only.